Macromedia Flash is a powerful & flexible technology and one of the latest incorporations in web design that helps designers to create an impact on the minds of visitors. Flash is used to make websites more interactive, attractive and visitor friendly. Quad SoftTech is a leading Flash Web Designing and development company in India, renowned for its long standing experience in creating quality interactive websites that work. 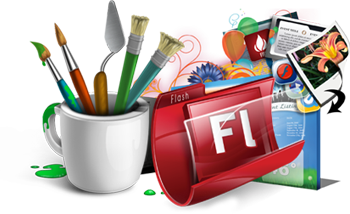 One of our specializations is Flash web designing. We make Flash animation presentations, banners, and movies and many more. We develop professional websites that feature a full range of graphics including home page introduction, online demonstrations, graphic presentations, flash logos for clients across the world. Create your own Personal and Business Interactive Flash Website with our Flash Website Builders. Quad SoftTech is a Multimedia and digital-media design firm based in India, committed to a philosophy of clarity and simplicity. We take pride in our direct approach, innovative design ideas and programming expertise. Quad SoftTech provides its clients with creative communications solutions including online brand development, advertising, web development and multimedia applications, corporate presentations, CBTs, WBTs, online learning courses and Flash CD presentations which are aligned to the client's business and marketing strategies. What differentiates Quad SoftTech from other offshore web design companies is that it creates unique and innovative designs and ideas to produce eye-catching graphic designs and dynamic Flash programming and action scripting.